I'm always looking to add sports books to my collection, but the challenge is that I don't always like reading them. There are many sports I don't enjoy, and I would rather be playing the ones that I do. I want to read all the books that I recommend to students, so the sports readers in my class end up with a slim selection. 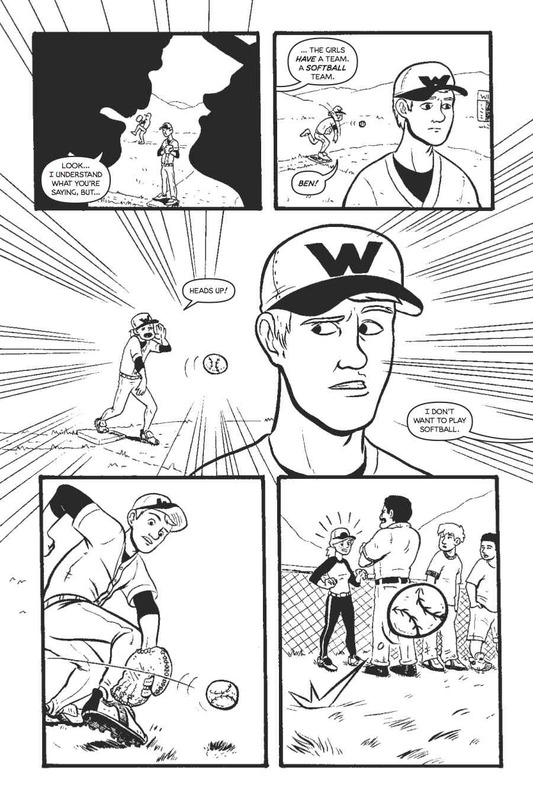 I feel fortunate to have found Play Ball, Nunzio DeFilippis and Christina Weir's newly released graphic novel about a girl who joins her school's baseball team. This is a book which I read eagerly, and that I know my students will love. After her parents' divorce, Dashiell moves to a new house, along with her mother and her fashionable sister, Arica. 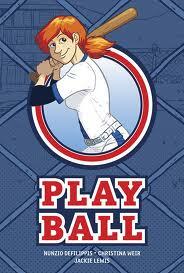 A change which excites Dash is that her new school has a baseball team that she is dying to join. Unfortunately, the only person who supports her dream is her mother. Arica fears social suicide, the coach and players claim that it's against the rules for a girl to join the team, the softball team is offended that she won't play for them, and her father won't even return her calls. Dash is an extremely likable heroine. Although she protests the school's policies about gender and sports, it won't be too radical for young readers; she really just wants to play the game she loves. Dash's talent is undeniable, yet she is relatable. She hides her disappointment behind a mask, lashes out at her mother when she is really angry at her father, and has conflicts with her sister. There are many different aspects to the drama in Play Ball, but the authors are able to resolve them in a satisfying way. While I would have preferred for the illustrations to be in color, I enjoyed Jackie Lewis' art. Her drawings of the baseball games kept me interested in a part of the book that I might have skimmed if it wasn't a graphic novel. Even better, Dash looks like a normal girl, freckled and unconcerned about anything but the game. Male readers won't be alienated by her character, rather, they will wish that they had a best friend like her. Play Ball is a key addition to the sports section of my library, a book that bridges interests and will appeal to all readers.